You can find lots of excellent recipes for cookies - a rather famous, if not infamous, one appeared in 2018, Alison Roman’s Salted Chocolate Chunk Shortbread cookies and was justifiably all the rage. And there are many bakers well-known for their accomplishments in the cookie-verse, especially Dorie Greenspan, whose complete collection of books - baking and otherwise - have earned prized space on on my own bookshelf. But when everything was said and done, I had a particular baker as my muse. This was not a surprise to me as I have been familiar with Alice Medrich for a long time. She had already given me a recipe for an almond cake on Page 73 of Pure Dessert, which I make often, and on FOOD52 she taught me the magic of using math to adjust pan sizes when baking. I have baked lots of her Classic Ginger Cookes in Flavor Flours and her Double Oatmeal Cookies also in Flavor Flours baked as recommended with raisins and walnuts and then adapted to use white chocolate chunks and dry-roasted macadamia nuts in place of the raisins and walnuts. But my personal favorite cookie is the little black dress of cookies. The cookie I know, no matter how many other good cookies I bake, I will turn back to time and time again. I found the recipe in Pure Dessert, one of the most physically beautiful books in my collection, and then realized the always-reliable Luisa had written about it a long time ago. By the time I got around to trying this recipe, I was already familiar with making logs of dough and had figured out that the best way for me to bake these cookies is to make the dough one day, roll it into logs, refrigerate the logs overnight, and bake them as soon as I get up in the morning. I keep a stainless steel ruler handy as I slice the cold dough into cookies, and I move quickly so they stay cold while slicing with a Messermeister Cheese Knife, which glides right through the dough even if there are chunks of chocolate hidden inside. I am such a newbie at this that I only bake one tray at a time ensuring that the cookies are evenly baked. Depending on how many cookies I will bake, I keep 4 to 6 half sheet pans at the ready so I never have to use a hot one and line them all with sheets of parchment from King Arthur Flour. 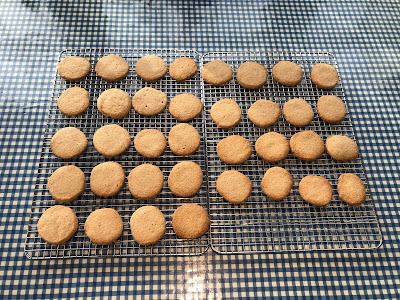 I have five cooling trays available and slide the parchment sheets right off the half sheet pans to cool, and then move the cookies off the parchment using a small offset spatula. These cookies are to me THE BEST. Thanks to Alice Medrich with a hat tip to Luisa. 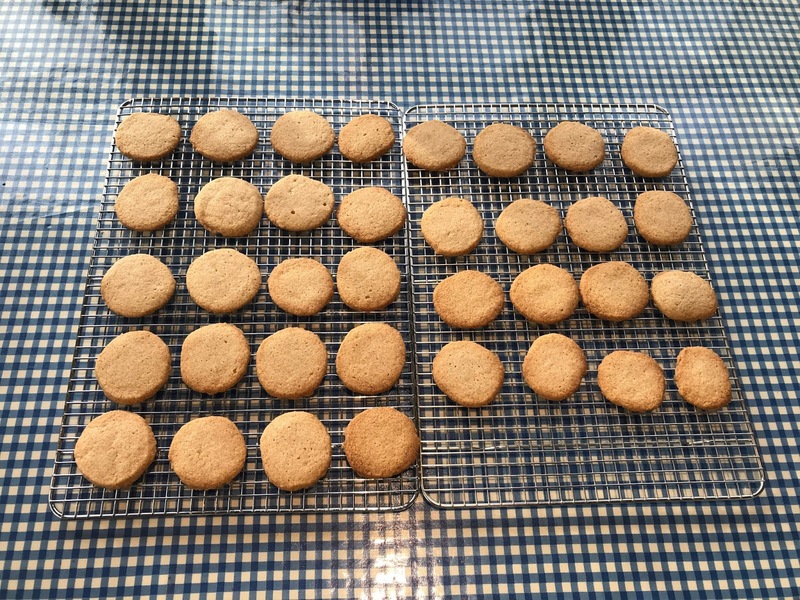 Full disclosure - Alice Medrich reduced the amount of butter by ¼ stick when she put this recipe again in her book Chewy Gooey Crispy Crunchy Melt-in-Your Mouth Cookies, and she must have had a reason, but I can’t bring myself to mess with what I think is the perfect cookie. Note 1: When baking, it's a good idea to have an oven thermometer in your oven to make sure the correct temperature is reached before baking. Note 2: Once the oven reaches the correct temperature to make sure it's really hot enough, don't put the first tray of cookies in until it has remained at this temperature for at least 15 minutes. Note 3: When you take a just-baked tray of cookies out of the oven, if you are not going to slip the next tray in the oven immediately, close the oven door behind you since you don't want the temperature of the oven to continue to drop. Open it only when you ready to put the next tray in. Preheat a convection oven to 325°F or a regular oven to 350°F. Stir the flours together in a bowl, and set aside. In a stand mixer fitted with the paddle attachment, beat the pieces of butter with the sugar, salt, and vanilla for about a minute, just until smooth. Turn off the mixer. Scrape down the sides of the bowl, add the flour all at once, turn on the mixer, and beat until the flour is just mixed in. Remove the dough and knead with your hands to make sure the flour is completely incorporated into the dough. Form the dough into one 12 x 2-inch log or two 6 x 2-inch logs the way Dorie Greenspan does, wrap the log or logs in parchment paper, and refrigerate for a minimum of 2 hours and, best, overnight. If you want to keep the logs perfectly round, use another Dorie Greenspan tip and cut a paper towel roll open, put the parchment-wrapped log inside, tape it closed with painter's tape, and set in the refrigerator. I like to make two logs because that way the dough doesn't soften too much while I am slicing cookies as I keep the second log in the refrigerator while I cut the first one. This helps keep the cookies round because they don't have time to get soft and flatten too much on the cutting board. Cut the logs into ¼-inch thick slices, and put the cookies 1-½ inches apart on cool parchment-lined baking sheets. I bake one tray of cookies at a time on a rack in the middle of my oven. Bake the cookies until they light brown at the edges. In my convection oven this takes 14 minutes. Take the tray with baked cookies from the oven, close the oven door to keep the heat in, set the tray on a cooling rack, put the next tray of cookies in the oven, move the sheet of parchment with the cookies on it from the tray to another cooling rack, and when cool enough not to break apart, move the individual cookies with a small spatula to a rack to cool. These cookies are better the next day, but don't let that stop you from tasting them! Alice Medrich says "They can be stored in an airtight container for at least a month." I doubt they'll be around to test that assertion. Note: There are two particular books I think anyone wanting to bake cookies should have, and they are Chewy Gooey Crispy Crunchy Melt-in-Your-Mouth Cookies by Alice Medrich and Dorie's Cookies by Dorie Greenspan. They would make a great gift for the aspiring cookie baker.